Archibald Goodman Frazer Nash founded Frazer Nash Ltd. in 1925. He set up a factory in Kingston upon Thames to manufacture V-twin and 4-cylinder sports cars. The Company evolved into AFN Ltd. in 1927. The cars were unusual because they were chain driven with no gearbox and used cogs and three or four chains to drive the solid one-piece back axle. They were quite successful in sporting events, but the total number sold was in the very low hundreds. Production ceased in 1938. H.J. Aldington joined AFN as a salesman in 1925. During the late 1920’s, he successfully raced Frazer Nash sports cars. In 1934, he discovered the powerful new BMW 6-cylinder. He suggested to BMW that AFN should use the engine under license. By 1935 a deal was struck and AFN became the appointed agent for BMW in Britain. Right-hand drive BMW’s badged as “Frazer Nash-BMW,” started to arrive at the AFN headquarters in Isleworth. By 1936, customers starting taking delivery of the new cars—sales of the chain-driven models quickly tailed off. More than 100 cars, mostly saloons and sports cars were imported each year. Part of the AFN automobile arrangement with BMW included an obligation to sell BMW motorcycles in the U.K. The bikes were ultimately distributed by AFN through their U.K. dealer network between late 1935 and 1939 and then sales resumed after World War II. AFN’s association with BMW continued until 1959. In 1959, AFN was promised a new BMW model to exhibit at the London Motor Show, but for some unknown reason, it went to another dealer. Somewhat “miffed,” the Isleworth Company terminated their twenty-four-year association with BMW. AFN took on Porsche for their future operations, becoming their sole U.K. concessionaire until 1965. 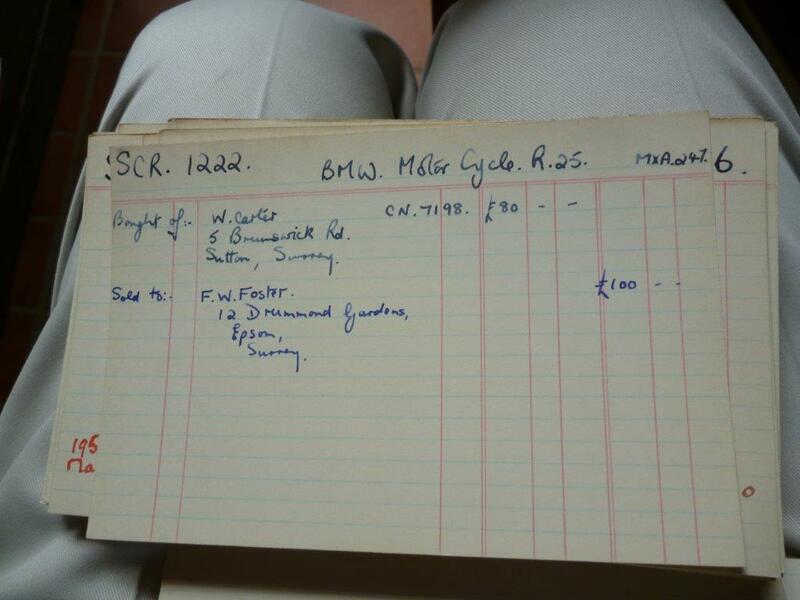 It was more or less common knowledge that AFN held meticulous records on many of the BMW motorcycles they imported over a thirty-year period. However, nobody seemed to know any specifics on the documents. How many BMW’s had been shipped to England from the mid-1930s to the early 1960s? What were the models? Nobody really knew for sure. The biggest hurdle facing anyone who wished to authenticate, (or map the history of his or her bike), was simply getting the data from the AFN Owners Club. 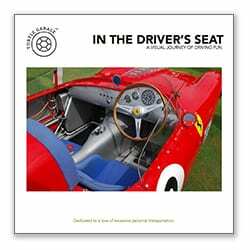 Not that there was any reticence on behalf of the Frazer Nash Owners Club, it was just that they did not have the resources to search the voluminous and obscure records. So why should I be interested in the AFN records? My Family connection with BMW goes back 74 years. In 1938, my late Father Cyril purchased a brand new BMW R5 from AFN. The bike was issued the registration number FJO 265. At that time the R5 was the “bee’s knees” of BMW. It was a trendsetting machine full of technology that was way ahead of its time. It had a 500 cc air-cooled boxer engine with overhead valves. It had a 6-volt coil ignition, 4-speed gearbox, shaft drive, and adjustable telescopic forks. Back in the 1930’s, the R5 was a really special machine with a beautiful design. Today, the R5 is iconic and remains one of the best-looking BMW’s of all time. Sadly, I did not personally know my father’s R5. I was only 3-years-old in 1945 and by then dad’s R5 was long gone. However, I recall many tales from my parents about their Wartime exploits. Once they were stopped at an army checkpoint—They thought that the German invasion had begun! In the late 1960’s I was able to purchase an identical 1937 R5 to my father’s bike. I found it (registration HMK 477) in St Albans and paid only £11.00! In the course of restoring HMK 477, I became interested in finding any information about my “new” R5 as well as my father’s R5 FJO 265. Eventually, and after a donation of £15.00 to the F.N. 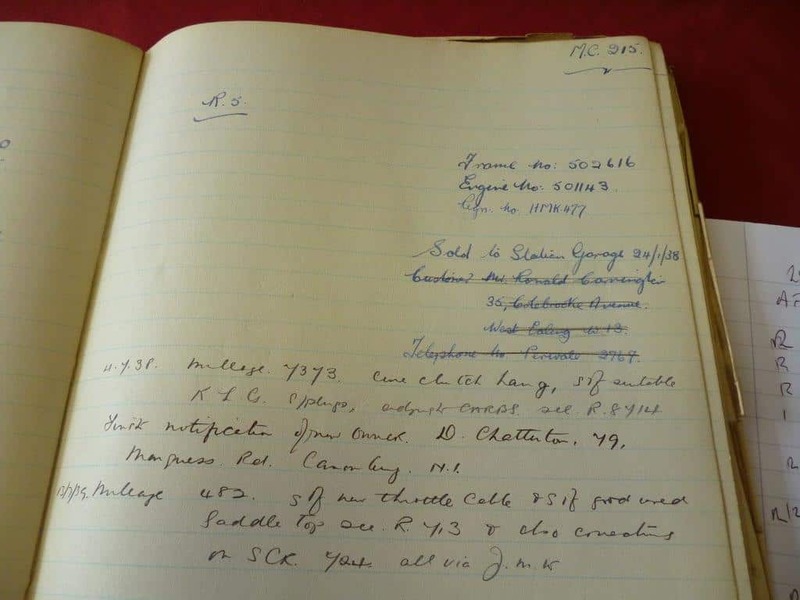 Archive, (they are a registered charity), I received the data I so desperately wanted—engine and frame numbers along with actual service records! AFN had detailed records on both HMK 477 and my father’s FJO 265! Several years later, I asked AFN if I could look at the records myself. 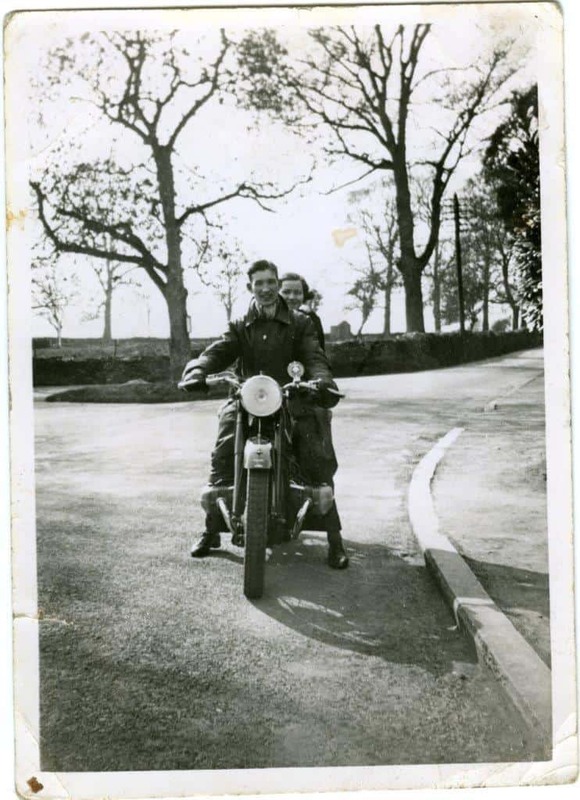 My goal was to uncover how many BMW motorcycles were imported to the U.K. before the war. The AFN wheels turned slowly and it took eight or nine years for them to grant permission. Because the entire AFN archive was the property of the Frazer Nash Car Club, there was not much enthusiasm towards Motorcycles. The AFN curator finally passed away and a door opened. My multiple consistent requests to view the AFN archives finally paid off! I was ultimately invited to The Frazer Nash Archives Open Day in Henley on Thames. Once there I was given permission to search the records to my heart’s content. 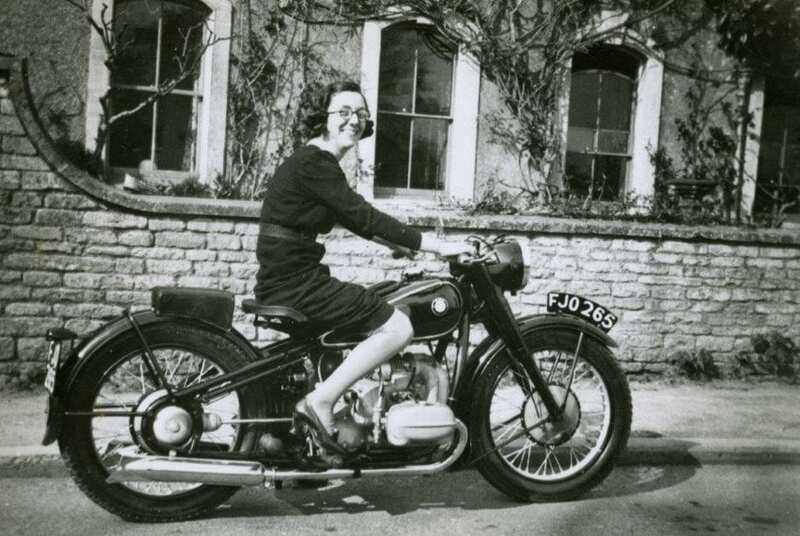 My research found that 217 BMW motorcycles were imported between mid-1935 and September 1939. The records also indicate that 79 BMW’s were traded in and resold by AFN from 1951 through 1959. Over the years I have found three more genuine BMW’s that were imported through AFN but for some reason not included in the record book. 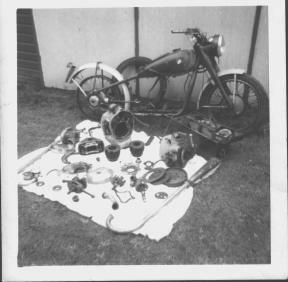 All bikes listed in the post-war records are trade-ins and second-hand sales. For ease of recording, (and avoiding mistakes), I used a digital camera to meticulously photograph the entire AFN motorcycle archive. I took a total of 305 images! The post-war records include BMW’s that AFN took in exchange and traded in. There were also, Triumph, BSA, Sunbeam, Velocette, Norton, NSU, Quicky, etc. listed in the archive. These other brands I ignored given my primary focus was BMW. If time permits, I may give some details on all the non-BMW records in the future. So, after a little history lesson, what did I find? All of my information has been shared with BMW’s corporate archive in Munich. BMW had no knowledge of the AFN records. They were somewhat alarmed to know of its existence because the engine and frame data could be very valuable if put into the wrong hands. Pre-war BMW’s have become a big business and fraud is an ever-present problem. If the AFN data were to fall into the public domain there would be a lot of “new” fraudulent BMW’s turning up on eBay with duplicate frame and engine numbers of bikes sold via AFN decades ago. I have assured the BMW archives, (and repeat here), that this information will forever remain secure and private. If a legitimate request is made to reference a pre-war BMW, (substantiated by a clear photo, or engine/frame number/registration number/original owner, etc. ), then and only then will I reveal information. The breakdown of the pre-war BMW imported AFN models are listed below. The import dates begin on June 13th, 1935 and end on August 26th, 1939. What kind of information do the records reveal? Model, engine/frame number, sometimes the registration number (FJO 265), to whom it was sold, maybe the date, and any subsequent service records or problems are among major items listed. In those days, the carburetors were fitted with ‘stops’ to prevent the throttle being opened fully, during the break-in period. These were sealed with a locking wire, only to be removed by the dealer. My Father told me about this, and it is confirmed when one looks at the records. As an example, I will quote from his entry. 17/5/38. Mileage 1724. General check of Carburetors. Engine vibration. see R 8446. What can be deduced from these records? 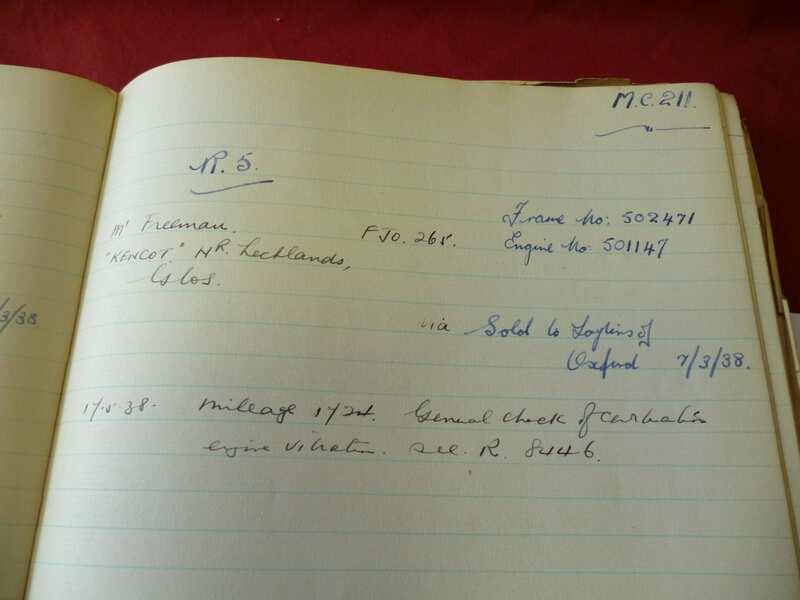 Firstly that the R 5 was sold via Laytons in Oxford, but it is not recorded in the AFN Archive except for this entry. We have dates, and the item “see R 8446” refers to the actual service records and work done, but these do not seem to have survived. There are some records for the period 1943—1944, but they are mostly records pertaining to automobiles. Date, model, owner, cost of labor and parts. However, there is one entry, 17th January 1944 for an R 17 owned by Mr. E.G.Lance. The parts cost £5/0/0, and that is all it tells. That would be over £500.00 by today’s average earnings. Mr. Lance’s name is not in the index. Six machines were sold for Export to Australia, via a firm called Scholefield Goodman. What else do the records reveal? There were mechanical problems. The R 5 and R 51 suffered from Clutch trouble, either the splines stripping from the center plate, or the plate losing is friction material. This problem might not have been a BMW design flaw. Owners might have been heavy handed with the clutch because the BMW clutch was very different than the multi-plate clutch on British machines. I have included a sample record for an R5 that had this specific clutch problem. It was sold to Bees Cycle & Co. 2/10/37, but was returned on the 26/4/38 with the clutch plate trouble. The other problem was pistons seizures, pistons nipping up, a broken tappet, another had the rear bevel changed, and the odd oil leak. The AFN affiliate dealers that sold these BMW’s will be familiar to many today as they were still in business during the 1950’s and 1960’s. Comerfords of Thames Ditton, Glanfield Lawrence, Claude Rye, Bryants of Biggleswade, Kings of Oxford, Rex Judd, Boyers of Bromley, Whitbys of Acton, Rowland Smith in Hampstead. MLG Ltd, Mick Riley of Aylesbury. Our Classic and Vintage Secretary, Robin Walker, tells me he knew of Mick Riley, having attended school near Aylesbury. What memories they bring back. As further evidence of my family’s BMW heritage, my brother bought an R 26 from Rowland Smith Ltd. The AFN archives also revealed many important post-war records. I have included a copy of the bill of sale for my R 25, registration number MXA 247, from circa 1955. The AFN record gives the model, registration number, who sold it and who bought it. In the case of MXA 247, no more information was provided. However, some records actually have engine and frame numbers, but the information is very basic and there are references to other records that no longer exist. In the post-war records, an R5 from 1936 was traded in by Bob Rillings. He sold it April 3rd, 1954 for £60.00 and it then AFN resold it on 29th April 29th, 1954 to a Mr. B King, for £75.00. Also listed is an R51. The Post War records break down as follows. What is listed as an R 51 that is actually from the engine/frame number of an R51/3. A number of the card index files are written in pencil, by what I would guess to be “Johnny Smith fresh out of School,” fortunately for us, he did not hold the job for long. Unfortunately, the post-war records are generally not dated. However, I have been able to loosely reconstruct the time periods because of the sequence of the index numbers. By using a given date, as in the sale of the R5, one can approximate. Returning to the 1935–1939 records I have sorted the recorded faults with each model as follows. R 5. Clutch = 4; Engine vibration = 3; Piston / seized = 4; Gear Box =1, though this was “Passed OK by JMW” Jock West. A total of 35 machines (17% of the total sold in the 1930’s) came back for major work over a four-year period. It was in the latter days of 1938 and 1939 that chrome failure became an issue. Many BMW parts were often sent out to be re-chromed. The chrome issue also applied to exhaust pipes and sundry other small parts, but not really worth recording. We must, of course, remember the social and political situation in Germany at that time. It stands to reason that the quality chrome work was being put into other spheres like aviation and various equipment needed for the war. Upon receipt of a specific request, I will inform the enquirer if there is any data that he or she unaware. Then if required, I supply the information for a nominal £10.00 donation. This will be in the form of a check, made payable to Frazer Nash Archives. I then forward the check to Frazer Nash, and the info, (in the form of a photographic image) will be provided to the enquirer, so they can see the actual primary source of the AFN record. I have it all at hand. In conclusion, we now have access to the primary sources that make up the beginning of BMW heritage in Britain. Some of us technically “own” these machines, but in essence, we are really only custodians for the next generation. Then of course, so was my BMW in 1963. I would like to thank James Trigwell, of the Frazer Nash Car Club, who arranged my access to the AFN Archive. He was also instrumental in correcting several mistakes I had unwittingly made. We hope this is the definitive version on the Motorcycle side of AFN. An amazing insight into the early workings of AFN. Interesting how important these machines were then, as they are to us now.